IPT News October 22, 2013 For a guy who claims to have nothing to do with the Muslim Brotherhood, Imam Shaker Elsayed dedicates a surprising volume of his Facebook page to the Egyptian Islamist group. 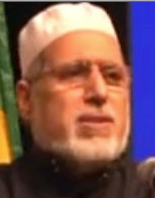 Elsayed, head of the Dar al-Hijrah mosque in Falls Church, Va., features a picture of deposed Egyptian President Mohamed Morsi – the Brotherhood’s candidate in 2011 – across the top of the page. Teenage girls post smaller images of Justin Bieber. Other posts seem to scapegoat Egypt’s Coptic Christian minority for the Muslim Brotherhood’s failure in power after one year. In fact, the Egyptian army moved only after Morsi refused to negotiate with opponents or call new elections as tens of millions of Egyptians took to the street. They felt Morsi focused more on consolidating power for the Muslim Brotherhood and other Islamists at the expense of Egypt’s crumbling infrastructure and economy. ‘This is not about the Muslim Brotherhood. It is not even about Dr. Morsi,’ Elsayed said. Neither he nor the EADHR, which also prominently features the R4BIA symbol on its Facebook page, has anything to do with the Muslim Brotherhood, he said. But Elsayed also served as head of the Muslim American Society (MAS) before becoming Dar al-Hijrah’s imam in 2005. MAS was founded in 1993 as the ‘overt arm of the Muslim Brotherhood in America,’ federal prosecutors wrote in 2008. ‘Everyone knows that MAS is the Muslim Brotherhood,’ Abdurrahman Alamoudi, once the most influential Muslim American political activist, told federal investigators in a January interview from a federal correctional facility where he is serving time. The mosque’s name means “land of migration,” and every Friday more than 3,000 worshipers from more than 35 countries pack into Dar Al-Hijrahh’s prayer hall. Doctors from Pakistan kneel next to hotel workers from Sudan. Refugees from Somalia pray alongside naturalized citizens from Egypt. It was founded by a group of Arab college students in the 1980s. Through local fundraising drives and assistance from a few foreign donors such as the Saudi Embassy, the congregation bought 3.4 acres in Falls Church and began constructing a $5 million prayer hall. Today, its immense stone facade — chiseled with a verse from the Koran and adorned with a minaret and domes — is just off Leesburg Pike, hidden by evergreens. Its members are, for the most part, intensely committed to their faith and deeply conservative. Monday through Thursday, when many Muslims pray at home or near work, Dar Al-Hijrahh regularly draws 200 to 400 worshipers, with many rising before dawn to get to prayer. All of the organizations are part of the US Muslim Brotherhood. In addition the Dar Al-Hijrah constitution mandates that the mosque’s nine member board of directors must include four members of the MAS including the National President or his/her designee and the National Executive Director or his/her designee. In 2004, the Washington Post did report on the ties between Dar Al-Hijrah and the MAS, a U.S. Muslim Brotherhood group close to the Egyptian organization and again in 2005 when Shaker Elsayed, the former secretary-general of the MAS was appointed as the Dar Al Hijrah imam. The departing imam, Mohammed Adam El-Sheikh, was a Muslim Brotherhood member in the Sudan and one of the founders of both the mosque and the MAS. He left the mosque to become the executive director of the Fiqh Council of North America (FCNA), another part of the US Muslim Brotherhood. Two of the 9/11 hijackers, Nawaf al-Hazmi and Hani Hanjour were also known to have attended Dar Al-Hijrahh.